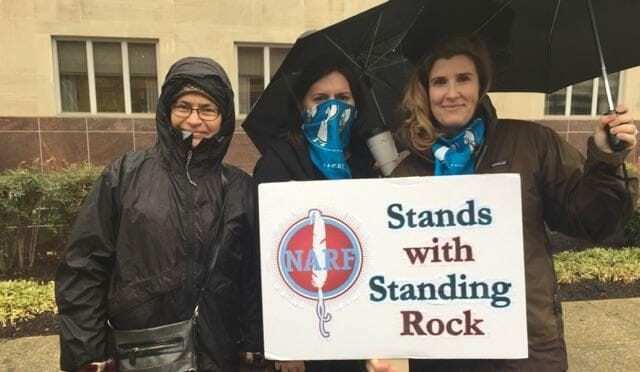 Friday, March 10, a number of Native American Rights Fund (NARF) attorneys and their families along with thousands of others took part in a peaceful march and rally, DC Stands with Standing Rock. This was an event staged and led by an indigenous community coalition in DC to support the Standing Rock water protectors. 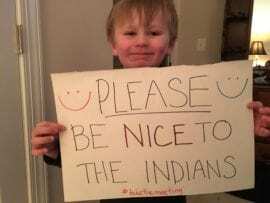 The event attracted thousands of Native and non-Native supporters from around the country. This event was one that elicited many emotions – elation, empowerment, strength – from those in attendance. Another reaction to this gathering was unity. Not just as Native people – although that in and of itself was a tremendous feeling – but unity as human beings and as United States citizens joining together to exercise our first amendment rights to demand the most basic of human needs, water, not be allowed to be placed in harm’s way by this administration for the sake of self-interest, profit, and corporate greed. Last August, NARF was honored to publicly come out and “Stand with Standing Rock.” NARF, as a legal organization, worked with the Standing Rock Sioux Tribe’s attorneys by taking the lead to develop and coordinate an effective amicus brief strategy in support of the tribe’s legal actions in order to provide a strong and unified voice in the federal courts. As individuals, some of NARF’s attorneys and staff members were traveling back and forth to the Standing Stone Camp to join family and friends in support of the tribe’s stand against the construction of the pipeline. Although to date the tribe has been unsuccessful in its attempts to stop the Dakota Access Pipeline from encroaching upon Lakota treaty land, the Standing Rock Sioux Tribe, the rest of the Oceti Sakowin, and all of the tribe’s allies are still hopeful that the flow of oil – if not the pipeline itself can still be stopped. Hence the reason for the march and NARF’s presence. 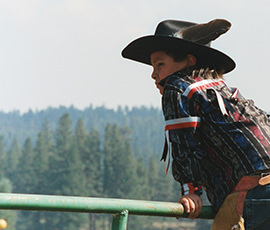 The Native American Rights Fund is more than just a legal organization. 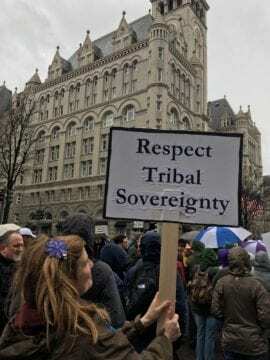 We are an organization made up of committed and dedicated individuals most of whom are tribal members with children and grandchildren, moms and dads, sisters and brothers, aunts, uncles and cousins who value their traditional ways and depend on NARF’s work to defend tribal rights and protect tribal sovereignty. But NARF can’t do it alone. Sovereignty is not free! Stand with us in our fight for Native Rights!